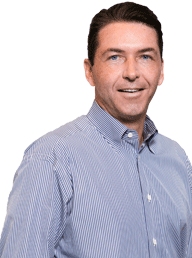 What Does the Recent US Stock Market Action Mean for 2019? The old saying “stock prices follow earnings” was not in effect during 2018. The S&P 500 delivered outstanding earnings growth of 22% during the year. However, this impressive earnings growth coincided with the worst performance for the S&P 500 in over 10 years, along with one of the worst single quarters since 1940. Practically overnight, the consensus shifted from overly bullish and believing in global synchronized growth, to overly bearish and calling for a recession. What happened? Many factors contributed to this volatile market action, but generally three causes contributed the most. First, as the negative trade war rhetoric escalated, investors began to see indications of economic slowing outside the US. Much of this weakness, especially in China, was in many ways due to the trade war and associated tariffs. At the same time, investors began to fear the Federal Reserve would overtighten by raising short-term interest rates too much, thus stunting our long economic expansion. As assorted economic releases started to peak and show weakness, these fears accelerated. Finally, the economic metrics morphed into fears of peak earnings growth, as it appears the third quarter of 2018 will be the peak growth rate of this cycle. In review, markets were a tale of two halves. The first half of 2018 saw easy earnings comparisons, falling corporate tax rates, low interest rates, low inflation, and high growth expectations. These positive factors quickly reversed in the second half of 2018 as investors braced for the effect of higher interest rates and higher inflation, just as earnings growth rates were peaking, earnings comparisons were becoming difficult, and valuations were 10-15% above average. 2.50%. Additionally, the ten-year US Treasury yield rose to 3.25% at one point – low historically, but the highest level since 2011. Fourth, the yield curve flattened where short-term interest rates nearly matched long-term rates. This indicated slower future economic growth, and possibly a recession on the horizon. Finally, and potentially very importantly, equity valuations plummeted. For example, the S&P 500 valuation fell from a forward P/E of 17 on October 1 to only 14 on December 31 – a major drop in only a single quarter. As we start 2019, what do valuations, fundamentals, and sentiment indicate for domestic equity markets? According to our work in analyzing long-term valuation history, the fair valuation point for P/Es and interest rates is approximately a P/E of 15.5 with ten-year US Treasury rates at a bit over 5%. When interest rates are lower than 5%, fair value P/Es float higher and vice-versa. On an interest rate adjusted basis, the S&P 500 ought to trade above a 17 P/E. This simply means unless earnings fall or interest rates spike, there is meaningful upside for US stocks. Even if earnings growth was revised down to 0% (no growth), there is at least 10% upside to fair value at present interest rates. Below we have inserted a valuation grid to show different S&P 500 price scenarios with varying earnings and P/Es. The bold figures around 2,500 equate to where the S&P 500 trades coming into 2019. For example, if earnings fall by 5% and the S&P 500 trades at a P/E of 16 – the S&P 500 would be at 2,493 or near the end of 2018 level. Fundamentally, investors are becoming quite bearish as many cyclical industries such as homebuilders, semiconductors, and airlines have recently guided down future earnings estimates. Some of these situations were due to rising interest rates; others were due to short-term oversupply or tough earnings comparisons. However, inventories have been falling throughout the economy recently. If this continues, they will need to be replenished, and the replenishment will be a tailwind for the economy. Additionally, Chinese economic stimulus could reach markets by the second half of 2019. Finally, if the multi-year strong US dollar trend can slow or reverse, the US economy and especially heavy exporters would be helped. Next is sentiment. To our investment team, sentiment is only a focus in our analysis at extremes. At extremes, sentiment can be an excellent tool in surmising when markets, an industry, or a company’s stock has reached an extreme high or low. The fourth quarter of 2018 was one of those periods when sentiment became important because it indicated a massive amount of bearishness, a phenomenon that can aid the bottoming process. Investor sentiment polls for both professionals and individual investors became very bearish in December. While over 60% of investors were bullish at September highs, fewer than 30% were bullish at December lows. Additionally, investors withdrew nearly $50 billion from US equity funds during the last three weeks of 2018. This was a near record amount of panic. Finally, in analyzing the fourth quarter of 2018, which was the 9th worst single quarter since 1940, the OPCM investment team wanted to provide some perspective on what a devastating quarter typically means for future returns. 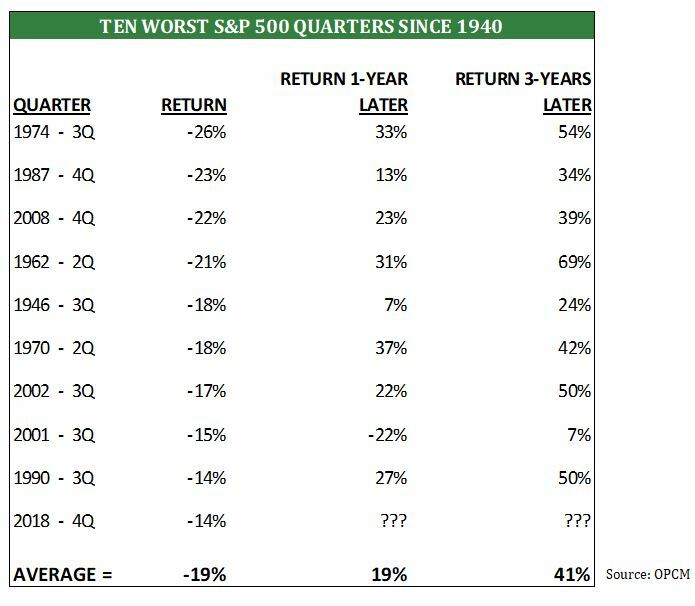 In the table below, we list the 10 worst quarters since 1940. For each of the 10 worst quarters, we show the S&P 500 return one year later and three years later. Of the nine prior to 2018, only one period saw a negative return one year after, which was the quarter ended September 30, 2001. The 9/11 terrorist attacks occurred in this quarter, and obviously affected markets and the entire globe for the next year. In looking at three year returns, there was not a single negative return, and the average rise was 41%. This history bodes well for the S&P 500’s future. To summarize 2018 and our thoughts into early 2019, last year was a poor year for all asset classes, as it was the first year without a positive return for any asset class (except cash) in at least 50 years. In the US, the S&P 500 was recently pricing in negative 5% earnings growth and higher interest rates. According to our research, many industries are pricing in a full recession and have solid risk/reward ratios. Sentiment was extremely negative at the recent low, which is a positive going forward. Just as expectations were elevated at the summer highs with a 17 P/E and rising interest rates, expectations are now low at a 15 P/E and interest rates potentially peaking with the Federal Reserve shifting to neutral. As we move deeper into 2019, expect more volatility during earnings season from mid-January through February. However with expectations reduced, companies that can guide to any meaningful growth while trading at a discount could be rewarded.